Welcome to our guide to the top indoor plants that remove toxins from your home. Outdoor air pollution affects millions every day. In many industrialized nations, air pollution is so severe that it can bring about alarming health issues. People in big cities are exposed to car fumes, cigarette smoke, chemicals, and industrial gasses. Air pollution causes numerous diseases that can be fatal. The effects of air pollution can also cause infertility and growth issues in children. There is an increase in the number of respiratory diseases and deaths caused by our ever worsening air pollution. What many people do not realize is that air pollution is not limited to the outdoors. You read that right. Even in the safety of your homes, there is air pollution. 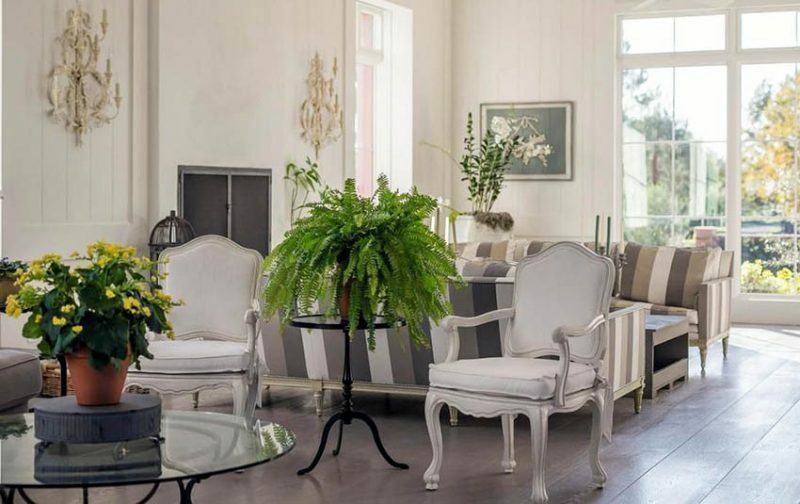 There are fumes from your furniture, paint, wood, and fabrics that cause indoor air pollution. NASA conducted a study involving houseplants to observe how they affect indoor air quality in enclosed spaces. They called it the Clean Air Study. Based from this study, there are types of indoor houseplants that can purify the air and greatly improve the quality of it. It has been confirmed that fumes from what we use inside the house greatly affect our health. Indoor air pollution causes migraines, eye irritation, nausea, allergies, dizziness, and organ failure. The results of the study indicate that it is best to have one houseplant per 100 square feet of home or office space. Trichloroethylene fumes come from inks, paints, lacquers, varnishes, adhesives and paint removers. It causes dizziness, headache, nausea and vomiting. Another common toxic fume is formaldehyde. We get this toxic fume from paper bags, waxed paper, facial towels, table napkins, plywood, and synthetic fabric. Common side effects include nose irritation, mouth and throat irritation, and swelling of the lungs and larynx. Benzene is commonly found in plastics, resins, synthetic fibers, dyes, detergents, pesticides, tobacco smoke, and vehicle exhausts. It causes eye irritation, headache, dizziness, drowsiness and confusion. Xylene can be found in paint, tobacco smoke, leather and paint products, and vehicle exhausts. It has been shown to cause mouth and throat irritation, dizziness, headache, confusion, heart problems, liver and kidney damage to name a few. With these in mind, here are indoor houseplants that have scientific studies confirming their ability to purify the air. Aloe has over 500 different species of flowering succulent plants. Its most popular one is aloe Vera or “true aloe” which is used for pharmaceutical purposes. It is also a common ingredient for hair products because of its ability to nourish the scalp and hair. Aloe is native to Africa, Madagascar, the Arabian Peninsula, and the islands on the Indian Ocean. It has been observed that aloe increases oxygen levels when placed indoors. It absorbs toxic fumes like formaldehyde, carbon dioxide and carbon monoxide. 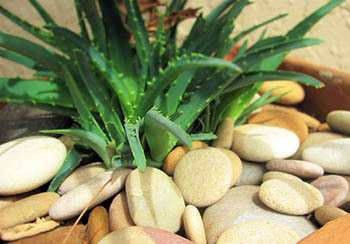 One pot of aloe is equivalent to nine biological air filters, which makes it an effective and efficient houseplant. 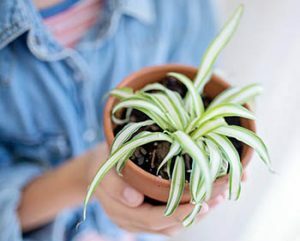 The spider plant is known by other names such as airplane plant, St. Bernard’s lily, spider lily, ribbon plant, and hen and chickens. It is a flowering perennial plant that is native to southern Africa. It is an extremely popular houseplant because it is easy to grow and needs minimal sunlight. It absorbs toxins like formaldehyde, carbon monoxide, and benzene. The English Ivy is also known as the common ivy or the European ivy. It is a flowering plant that is native to Europe and western Asia. It is a clinging evergreen vine that can usually be found on walls, fences, and trees. It is now cultivated as an ornamental plant. The extracts of this plant are used for medicinal purposes specifically for cough. 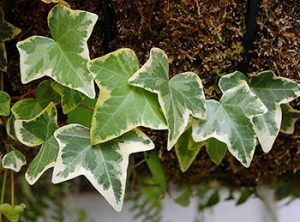 The English Ivy is known for its ability to absorb 60% or airborne mold and 58% of airborne feces within 6 hours of being placed in a room. There are over 40 species of this flowering plant. 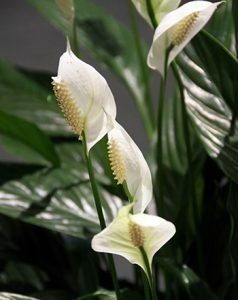 Peace lily is native to the Americas and Southeast Asia. It lives best in shady places which makes it an excellent indoor houseplant. It only needs water once a week to make sure the soil is moist. It filters out benzene, trichloroethylene, and formaldehyde. This plant is known for its other names such as mother-in-law’s tongue and viper’s bowstring hemp. It is a species of flowering plant that is native to West Africa. It is cultivated as an ornamental plant. 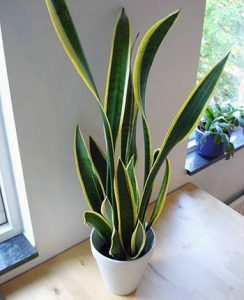 Based on NASA’s Clean Air Study, the snake plant successfully removes 4 out of 5 toxins in the air. If you enjoyed this article and want more, check out our page about growing air plants here.